Where do comets come from? There's a dark, cold region of the solar system where chunks of ice mixed with rock, called "cometary nuclei," orbit the Sun. This region is called the Oört Cloud, named after the man who suggested its existence, Jan Oört. While this cloud of cometary nuclei is not visible to the naked eye, planetary scientists have been studying it for years. The "future comets" it contains are made mostly of mixtures of frozen water, methane, ethane, carbon monoxide, and hydrogen cyanide, along with rock and dust grains. The cloud of cometary bodies is widely dispersed through the outermost part of the solar system. It's very distant from us, with an inner boundary 10,000 times the Sun-Earth distance. At its outer "edge," the cloud stretches into interplanetary space some 3.2 light-years. For comparison, the closest star to us is 4.2 light-years away, so the Oört Cloud reaches almost that far. 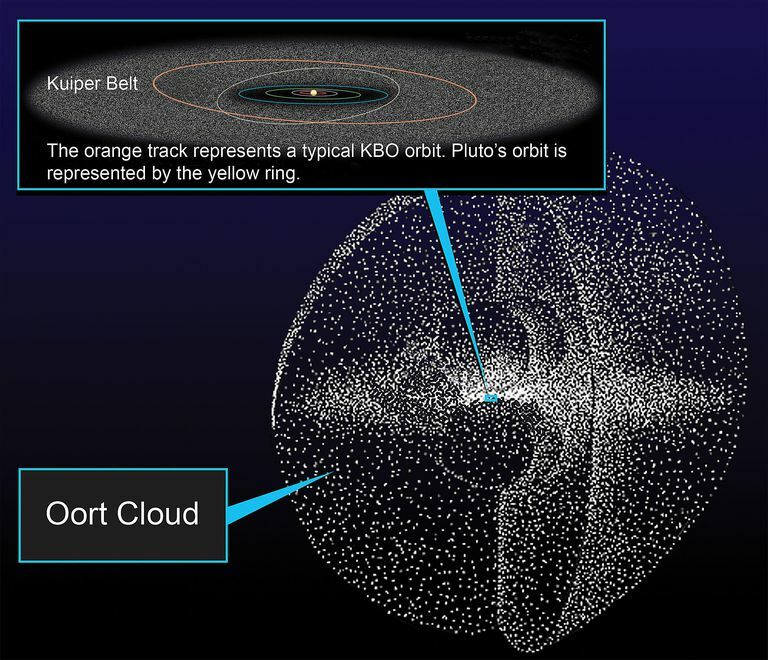 Planetary scientists estimate the Oort Cloud has up to two trillion icy objects orbiting the Sun, many of which make their way into solar orbit and become comets. There are two types of comets that come from the distant reaches of space, and it turns out they don't all come from the Oört Cloud. Comets and Their Origins "Out There"
How do Oört Cloud objects become comets that go hurtling in orbit around the Sun? There are several ideas about that. It's possible that stars passing nearby, or tidal interactions within the disk of the Milky Way, or interactions with gas and dust clouds give these icy bodies a kind of "push" out of their orbits in the Oört Cloud. With their motions changed, they're more likely to "fall" in toward the Sun on new orbits that take thousands of years for one trip around the Sun. These are called "long-period" comets. Other comets, called "short-period" comets, travel around the Sun in much shorter times, usually less than 200 years. They come from the Kuiper Belt, which is a roughly disk-shaped region that spans out from the orbit of Neptune. The Kuiper Belt has been in the news for the past couple of decades as astronomers discover new worlds within its boundaries. The Oört Cloud is divided into two parts. The first is the source of the long-period comets and may have trillions of cometary nuclei. The second is an inner cloud shaped roughly like a doughnut. It, too, is very rich in cometary nuclei and other dwarf-planet-sized objects. Astronomers also have found one small world that has a section of its orbit through the inner part of the Oört Cloud. As they find more, they will be able to refine their ideas about where those objects originated back in the solar system's early history. The Oört Cloud's cometary nuclei and Kuiper Belt objects (KBOs) are icy remnants from the formation of the solar system, which took place about 4.6 billion years ago. Since both icy and dusty materials were interspersed throughout the primordial cloud, it's likely that the Oört Cloud's frozen planetesimals formed much closer to the Sun early in history. That occurred alongside the formation of the planets and asteroids. Eventually, solar radiation either destroyed the cometary bodies closest to the Sun or they were collected together to become part of planets and their moons. The rest of the materials were slingshotted away from the Sun, along with the young gas giant planets (Jupiter, Saturn, Uranus, and Neptune) to the outer solar system to regions where other icy materials were orbiting. It's also very likely that some Oört Cloud objects came from materials in a jointly shared "pool" of icy objects from protoplanetary disks. These disks formed around other stars that lay very close together in the Sun's birth nebula. Once the Sun and its siblings formed, they drifted apart and dragged along the materials from other protoplanetary disks. They also became part of the Oört Cloud. The outer regions of the distant outer solar system have not yet been deeply explored by spacecraft. The New Horizons mission explored Pluto in mid-2015, and there are plans to study one other object beyond Pluto in 2019. Aside from those flybys, there are no other missions being built to pass through and study the Kuiper Belt and Oört Cloud. As astronomers study planets orbiting other stars, they are finding evidence of cometary bodies in those systems, too. These exoplanets form largely as our own system did, meaning that Oört clouds could be an integral part of any planetary system's evolution and inventory. At the very least, they tell scientists more about the formation and evolution of our own solar system.